We can already see that bus number 1 will arrive after bus number 2! Pitty for passengers who have been waiting for the 11:35 this morning - its very cold out there! Bus number 1 seems to have caught up a bit and is now due at the same time as number 2. So its now due and my wife is at the bus stop knowing that the bus is due now. 11:49 and the bus arrives. It was the only one that appeared at the bus stop so i can only assume that one of them cut across the top and left out Keswick altogether. 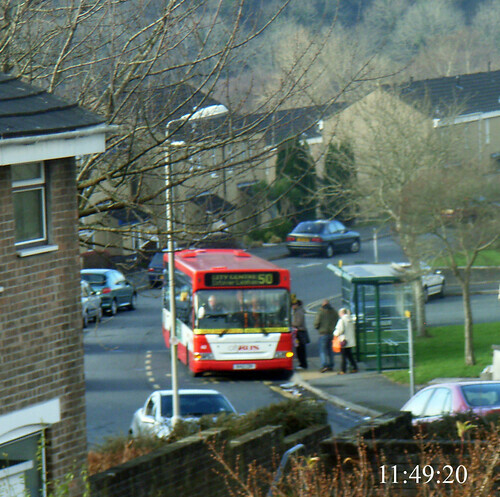 This does make sense as there is no point in both buses following each other down the hill. My wife informed me this bus was almost empty so it must have been following the earlier one. A few minutes later and both buses are still showing as being due. It does seem that the service is pretty accurate as long as you dont leave it down to the last couple of minutes. Im just the sort of passenger who would see the next bus due in 2 mins and then go to the bus stop as its less than one min walk from my house. The service would though have saved waiting for the 11:35 as it clearly wasnt going to get here at that time. 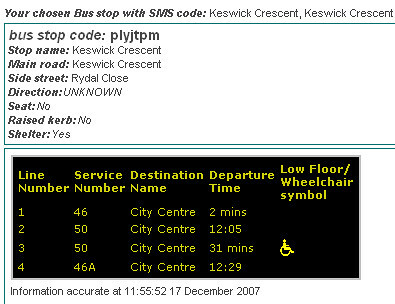 Just one final note - the bus stop information handily gives details of the facilities at each stop with Keswick being shown as having a shelter but not a raised kerb or a seat. Well actually it does have a raised kerb - and it does have a kind of seat - one of those horrible two bar seats ideal for pensioners with lots of padding but no good for me!